This week we celebrated our older daughter's second birthday. Before you begin I must warn you that this is a lengthy post. Now, back to what I was saying... I still cannot believe my little girl is two years old! It seems like only yesterday when I was rushed to the hospital only to endure the longest labour in the world (or so it seemed) and then be greeted by a new life staring back at me. Instead of throwing her a party this year I decided to keep things small and intimate. It's easy for a child to be overwhelmed and honestly at this age, everyone who attends are more likely to be my friends than hers anyway. The night before her birthday, I turned one of our spare rooms into an explosion of balloons and pink and yellow. For those of you on my instagram you're probably sick of seeing pictures of the decor by now. But if you stick around, I promise there's something different towards the end of the post. While browsing cake inspiration online, I stumbled across the idea of a paintable cake. The genius behind the gorgeous baking blog Sweetapolita created a birthday cake covered in white fondant so her kids could decorate and paint themselves. As soon as I saw it I knew I had a winner. The idea for a cake canvas was just too charming to pass up. I used strawberry box cake mix with vanilla meringue buttercream and store bought fondant. This was the first time I've used meringue buttercream and it made a huge difference to the cake. The meringue component made for a light and icecream like icing. It won't be easy going back to regular buttercream after this. Thank you to Sweetapolita for the wonderful recipe and inspiration. 1. Rub small amount of lemon juice or vinegar in bowl and mixer to remove any trace of grease. 2. Add egg whites and sugar and simmer over a pot of water till sugar has dissolved, whisk gently. 3. With mixer, whisk egg white until mixture is thick and glossy. 4. Add one butter cube at a time mix over low speed until a thick, silky smooth texture is achieved. 5. Add vanilla and salt, mix well. Use immediately. Here's a look at my daughter's first birthday party from last year. We were in Australia at the time so I was fortunate to have my mum and sister around to help out. Actually, my talented sister was the one who made the three-tiered birthday cake. Being winter at the time (Southern Hemisphere) I wanted to inject colour and vibrancy into the day so I themed the party around a spring garden. There were pompoms galore, grassy cupcakes, toffee apples, fairy floss machine, chocolate fountain, and an explosion of pink and green. I'm embarrassed to say there were more people at my daughter's first birthday than there were at my own wedding. Happy birthday to your doughter! Happy birthday to your lovely little girl! I'm so jealous of your baking skills!! That cake looks flawless...and yummy!! Happy birthday little one! :) What an awesome idea and the decor for the party was perfection! Wow, 2 years old already! Happy birthday to the little cutie pie. 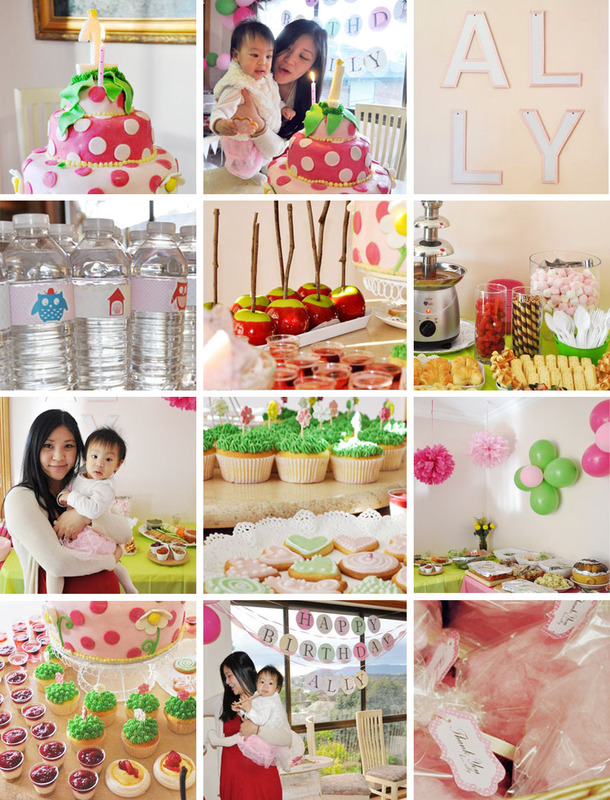 Your birthday party decor is amazing, so adorable and so perfect. I love the paintable cake idea, so cute! aww what a colour splash! that cake looks soooo yummy! Great birthday decorations! You are so talented by making that gorgeous cake! And you have two lovely babies!!! If you have a chance, please check out my blog! Looks so yummy! I love how you mix and match the colors! This is just so lovely!! You can see the delight in Ally's face with the cake!! So, so, so BEAUTIFUL! P.S. can you by my mum too?? I'm just blown away by the amount of thought and effort you'd put into the party. And the food! They look incredible. My 6 year old would love to have a paintable cake. Thank you for sharing this (still mesmerized by the amazing food on the table). What a beautiful and feminine party! Great photographs and that cake looks amazing! What a beautiful event, your thoughtfulness is definitely portrayed in all of the details. Gorgeous! Omg the cake look so good! the cuteness is so unreal! and wow, do you come from a family of cake masters? The cakes always look so professional, maybe you open up a bakery? I also left you a long message on your fb page that ended up on the right hand side. The little fb icon doesn't show that its me. so beautiful! love th cake idea! Wow this looks delish!!! Thank u for commenting on my blog, it would be great to stay in touch and maybe follow each other? Wow, this all looks so wonderful!! I love the canvas cake! You're such a cool Mum Jenee, I can't wait to bake cakes for my little baby too! Fingers crossed it's a girl! You're doing it all and with such style! So inspirational!